From this tree comes the famed neem oil. Neem oil is a vegetable oil extracted from the fruits and seeds of neem tree. The oil is light to dark brown in colour depending upon its method of processing. It is very bitter in taste mainly because of its triglycerides and triterpenoid compounds. It is used for several purposes. Neem oil contains fatty acids like oleic acid and linoleic acid which are beneficial for the skin. The benefits of neem oil are many. 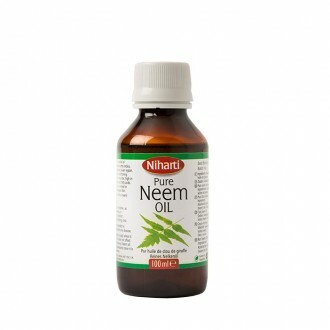 Niharti Neem Oil is a volatile oil obtained from the Neem plant native of India and surrounding Asia..